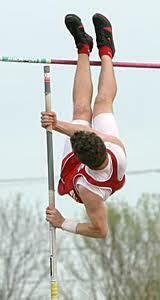 When I was fifty years younger and fifty pounds lighter I tried my hand at pole vaulting, a peculiar track and field event that involves running at full speed with a heavy pole (at that time still rigid aluminum) in hand, planting the pole at the last second with jarring force on the body, hurling your feet overhead at just the right moment in order to maximize upward momentum and finally, pushing off from the pole as it reaches vertical and squeaking past the crossbar without knocking it off. A successful vault involves a great deal of technical and tactical knowledge as well as strict choreography and constant practice. These things I learned from a little bit of book study and much trial and error. In the end, the game is the best teacher. But what about the coach’s role in developing my ability? I laughed out loud at his response and I still laugh today when I think about his answer. Granted, there are many events in track and a coach will not likely be expert with all of them, but it seemed like he should have been able to provide greater insight. He had watched my vault intently, but could offer no guidance how to improve it. So what does this have to do with Lean? How much should today’s managers-become-coaches know about the details of Lean? I often hear them demur, “I don’t want to get into the weeds.” Could that be an excuse or are the details really for someone else – perhaps a lean specialist – to understand. Many years ago, a fellow manager, a good friend, offered to me what I think he thought was a compliment: “Continuous improvement is really your thing, Bruce. My thing is management.” This seemed to me to be a perverse division of labor. Granted, a manager cannot be omniscient or omnipresent, but when new learning is required, we should not think we are exempt from study. Whether a track coach or a business coach, there is a technical side to our work, which “granular” as it might be, will make us better coaches if we understand it even modestly. If we want to help our employees ‘clear the bar’, we’d best invest in our own learning first. How is your coaching? Are you above the fray, delegating Lean learning to someone else or are you personally developing your own skills in order to be a better coach? Please share a comment. BTW: Sign up here for my next free webinar, “Tea Time with Toast Dude.” The topic will be “Killer Measures”, traditional measures that can derail your lean implementation. Hope you can join me on Tuesday, December 10 from 3:00 – 3:40 p.m. EST. Read more & register. This entry was posted in Old Lean Dude and tagged bruce hamilton, change management, coaching, continuous improvement, lean, lean in healthcare, lean manufacturing, management, Toast Kaizen on December 2, 2013 by GBMP. Simple but profound lesson Bruce. Keep up the good work. Just another great story from Bruce, that about half the people who read will understand. My amusment comes from watching people and companies leap from one lean hobby horse to the next when consistancy is so fundamental to success. Since seeing Kaizen Toast for the first time I have been a follower of Bruce and his teachings and it is not rocket sience it is about achieving culture change through respecting peoples opinions and giving them control of their work place in a real and respectful manner while transforming their Managers from Managers to Coaches and if the Managers cannot make the transition move them on and get a manager that can be moulded. My job is now full time moving from area to area and plant to plant working with teams for about 3 months to achieve lasting culture change the goal is to build such a strong culture of ownership that the team generally decides the path and the Manager/Coach plays a support and advisory role. When I move into an area in the first or second meeting with the team I play the kaizen toast video and the impact is always profound. Thanks Bruce your a legend.